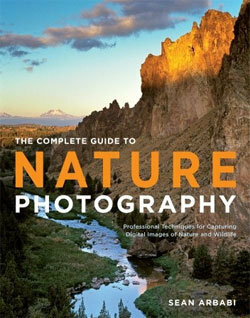 If you are an aspiring nature or wildlife photographer, then you need to read this book. Sean Arbabi is the perfect guide for this adventure into shooting nature. His work has featured in over 250 different publications including national geographic. Staring from the very beginning, Sean takes us through safety for your self and your precious equipment before even mentioning anything about technique. As an expert in the field, he knows the importance of keeping yourself safe when shooting in what often turn out to be challenging and secluded conditions. He devotes the whole first chapter to you and your equipment's safety in a wide variety of conditions and the rules of shooting in the wild environments often untouched by human hands. Everything you would want to know about wildlife photography is here in this book. He talks us through composition and what lenses to use, before going on to discuss all the different camera features that effect shooting in the wild. The book is packed full of photos, and Sean explains for every single one how he came across it, why he thinks it's a good shot, and the settings he used to achieve it. This compliments the techniques he explains to us beautifully, and helps the reader, no matter what skill level they may be at, understand how and why these things matter. Basically, the book covers all the things you need to know about DSLR photography, with wildlife and the natural world in mind. This makes it ideal for keep amateurs and enthusiasts looking to better their nature photography whilst also learning how to use their camera to its full potential. After looking at how you can best use your camera Sean then turns to the animals themselves. He covers animal behaviour and how to anticipate what they will do next, thus enhancing the shots taken. Overall, this book is a brilliant guide for photographers at any level of DSLR photography who want to start, or improve, their nature photography. The imagery throughout is stunning, and not only looks beautiful but also helps the reader to understand and implement the skills they illustrate. Sean is truly a master of the genre.